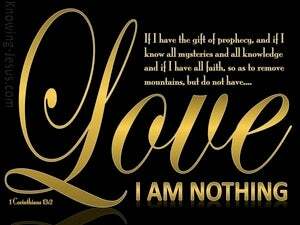 ﻿ 1 Corinthians 13:2 If I have the gift of prophecy, and know all mysteries and all knowledge; and if I have all faith, so as to remove mountains, but do not have love, I am nothing. 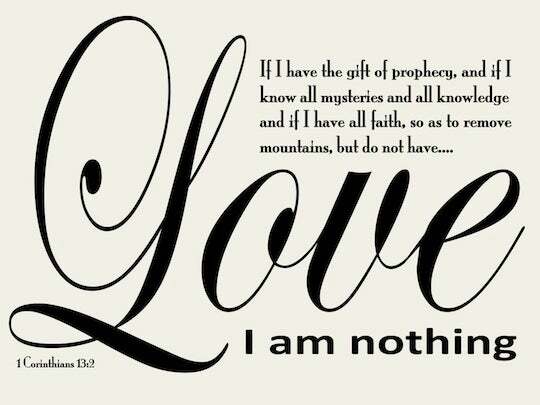 If I have [the gift of] prophecy, and understand all mysteries and all knowledge, and if I have all faith, so that I can move mountains, but do not have love, I am nothing. If I have the gift of prophecy and can understand all secrets and every form of knowledge, and if I have absolute faith so as to move mountains but have no love, I am nothing. And if I have prophecy, and know all mysteries and all knowledge, and if I have all faith so as to remove mountains, and have not love, I am nothing. And if I have the [spiritual] gift of prophecy, and can understand all [of God's] secret purposes, and have all knowledge; and if I have all [the supernatural] faith necessary to relocate mountains [See Matt. 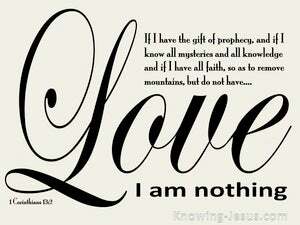 17:20], but do not have love [for people], I am nothing. 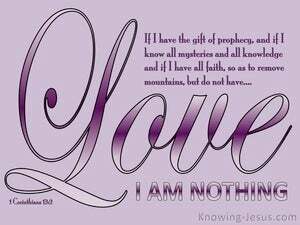 If I have the gift of prophecy, and understand all mysteries and all knowledge; and if I have all faith, so as to remove mountains, but have not love, I am nothing. and tho' I should have the gift of prophecy, and understand all mysteries, and all knowledge; and tho' I had all the faith necessary to remove mountains, and had no benevolence, it would signify nothing. And if I have the gift of prophecy, and understand all mysteries, and all knowledge; and if I have all faith, so as to remove mountains, and have not divine love, I am nothing. If I am inspired to preach and know all the secret truths and possess all knowledge, and if I have such perfect faith that I can move mountains, but have no love, I am nothing. And though I have the gift of prophecy, and understand all mysteries and all knowledge, and though I have all faith so as to remove mountains, and have not love, I am nothing. And though I have the gift of prophecy and understand all mysteries and all knowledge, and though I have all faith, so that I could remove mountains, and have not charity, I am nothing. And if I have the gift of prophecy, and know all mysteries, and all knowledge; and if I have all faith to remove mountains, and have not love, I am nothing. And if I have [the gift of] prophecy and I know all mysteries and all knowledge, and if I have all faith so that [I can] remove mountains, but do not have love, I am nothing. And though I have prophecies, and understand all mysteries and all knowledge; and though I have all faith, so as to move mountains, and do not have charity, I am nothing. And though I could prophesy, and understood all secrets, and all knowledge: yea, if I had all faith so that I could move mountains out of their places, and yet had no love, I were nothing. Though I have the gift of prophecy and understand all mysteries and all knowledge, and have all faith, so that I could remove mountains, but have not love, I am nothing. And though I have the gift of prophecy, and understand all mysteries and all knowledge, and though I have all faith, so as to remove mountains, and have not love, I am nothing. And if I have prophecy, and understand all mysteries, and all knowledge, and if I have all faith so as to remove mountains, and have not love, I am nothing. And though I have the gift of prophecy, and know all mysteries, and all manner of science; and though I have all faith, so that I could remove mountains, but have not love, I am nothing. Even though I have the gift of preaching, and fathom all hidden truths and all the depths of knowledge; even though I have such faith as might move mountains, yet have not Love, I am nothing! If I possess the gift of prophecy and am versed in all mysteries and all knowledge, and have such absolute faith that I can remove mountains, but am destitute of Love, I am nothing. If I should have the gift of prophecy, And know all secret truths, and knowledge in its every form, and have such perfect faith that I could move mountains, but have no love, I am nothing. If I have the gift of prophecy, and know all mysteries and all knowledge; and if I have all faith, so as to remove mountains, but don't have love, I am nothing. And though I have the gift of prophecy, and am acquainted with all mysteries, and all knowledge: yea if I have faith, even. to remove mountains, and have not charity, I am nothing. Therefore, my brethren, desire earnestly to prophesy, and do not forbid to speak in tongues.